Pinot Meunier has proved a powerful proposition for Champagne Jean Moutardier despite stagnating sales for the brand in its key markets. 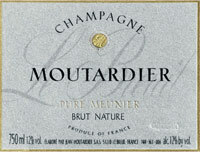 The company launched a 100% Pinot Meunier Champagne in 2004 called Cuvée Pure Meunier with initially a 2,000 bottle production, although last year it sold a record 3,500 bottles. The wine is not only unusual because it is a white Champagne from entirely Pinot Meunier, but also because it is made in the brut nature style with no-added sugar. Winemaker William Saxby explained that the cuvée was launched to “show what we can do with Pinot Meunier and what we can do with our terroir,” referring to the brand’s vineyards in Le Breuil. However, he said Champagne Jean Moutardier’s production had slipped slightly from its peak of 300,000 bottles due to the “economic situation”, and the loss of its major UK customer Great Western Wine, which was absorbed into Enotria in 2010. “We have to find new markets,” he concluded. Click here to read about the quality potential and stylistic diversity of Meunier in Champagne. Champagne Direct France is pleased to announce that the full range of Jean Moutardier Champagnes will be available in the UK within the next few weeks. Our new UK office will be open shortly and our range of 77 champagnes will feature the award winning Jean Moutardier range! Grant Endersby, Managing Director, Champagnes and Wines Direct Ltd T/A Champagne Direct France.